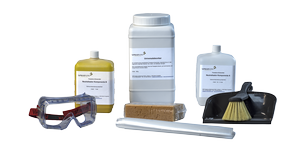 ​RAW Hydrofluoric Acid Spill Kits are a mix of products specially designed for the safe handling of hydrofluoric acid spills (hydrogen fluoride, hydrofluoric acid). Conventional chemical sorbents are not suitable for absorbing hydrofluoric acid, because chemical reactions take place. It is necessary to employ special hydrofluoric acid sorbents. ​​​Hydrofluoric acid is a colourless liquid with an extremely acrid odour normally used for etching glass and metal; it is also employed in the oil industry and in the semiconductor manufacturing. The vapours of hydrofluoric acid cause severe burns to eyes, mucous membranes and skin. When it comes into direct contact with the skin, the hydrofluoric acid is quickly absorbed through the skin and it penetrates deep tissue layers. This causes severe burns of the underlying tissue layers, maybe without involving visible damage. Pain may occur delayed for up to several hours. Hydrofluoric acid is a strong contact poison, a burn having the size of a hand with hydrofluoric acid in a concentration of 40% often causes death due to the resorptive poisonous action.